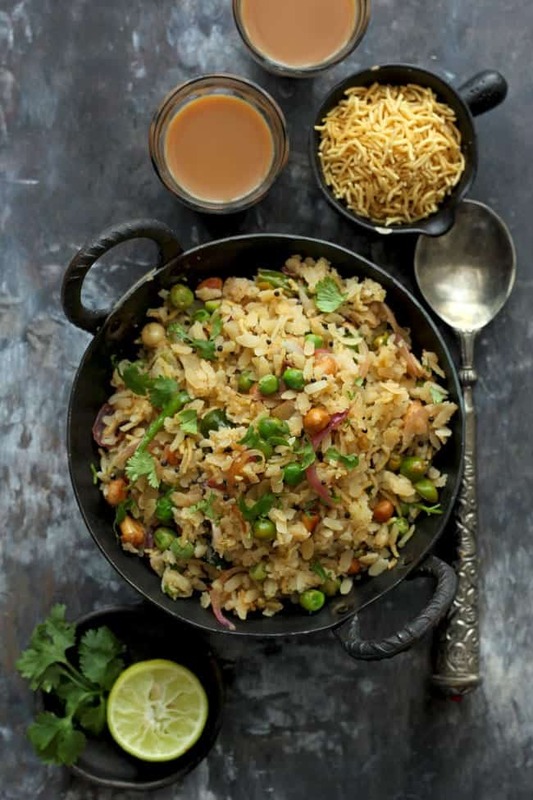 Matar Poha Recipe is one of the most loved Indian breakfast recipes. In different parts of India, this simple breakfast dish has various names – Chura Matar, Banarasi Chura Matar, Vegetable Poha or Kanda Poha. Each version of poha recipe is equally delicious and has a distinct taste to it. Light on the stomach and perfectly simple to prepare matar poha is one of our favourite all-time Indian breakfast dishes. Or I should say matar poha recipe gets the unanimous family vote of the best weekend breakfast. Poha is the Indian name for flattened rice or rice flakes. In many parts of the country, they are also known as chura. The flattened rice flakes are commonly used in the Indian sub-continent to prepare breakfast, snacks or desserts. Matar Poha Recipe or Banarasi Chura Matar is the Indian breakfast dish prepared using the flattened rice flakes. There are many ways to cook flattened rice. The most common one is to prepare a simple Indian breakfast dish – poha. An utterly simple dish that requires few basic ingredients and yet it is one of the most delightful breakfast. 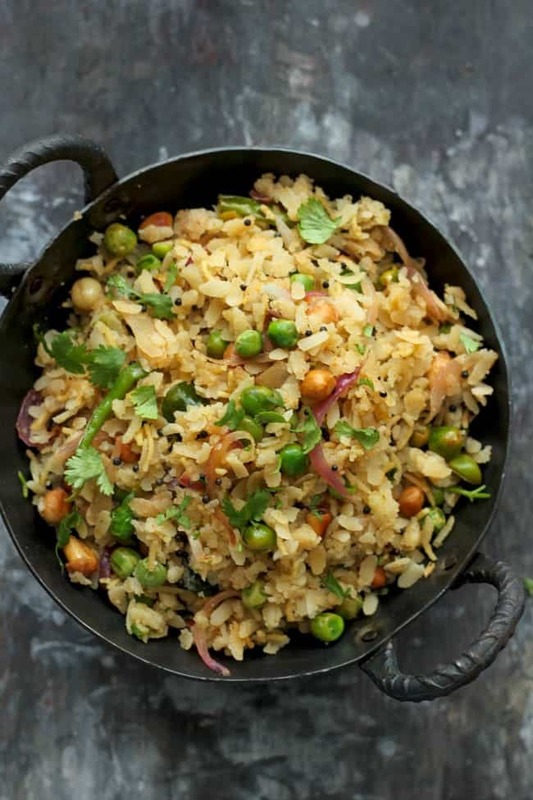 One thing that I love most about the poha recipe is – it is a flexible dish. I mean one can totally customize it as per their preference. Like during the winter season I tend to add tons of fresh green peas in the poha or on other occasions, finely diced potatoes are added. At times, I prepare it only with the sliced onions as they call it kanda poha. There can be an infinite combination of vegetables and flattened rice. How do I like my matar poha? Undoubtedly with tons of fresh green peas. Whenever I am making poha the ratio of flattened rice and green peas is 1:1. There are few accompaniments that are must be served with poha – chai, green chutney and aloo bhujia. The right way to plate a poha is to cover it with a generous layer of aloo bhujia followed by a drizzle of chutney and lemon juice. This gluten-free and vegan-friendly Indian breakfast recipe can also be served as a tea-time snack with a hot cup of masala tea. I love the dishes that double as an excellent breakfast and a fulfilling evening snack. On a busy weekday, I prepare a large batch of matar poha. Why? Some of it we enjoy as breakfast, the leftover is packed for his office snack box and the last one bowl is saved to accompany my evening cup of green tea (since I don’t drink milk tea). I usually add a teaspoon of green chutney and sweet chutney while making the matar poha. Somehow, the trick always gives a unique taste to the poha. If you are not having sweet chutney in stock then add a little bit of white granulated sugar in the poha. I am sure you will feel the delicious difference in the taste. If you try this poha recipe and love it, please leave a comment and a rating. This helps us grow and reach many other food lovers like you, who are looking for a perfect tried and tested recipe. 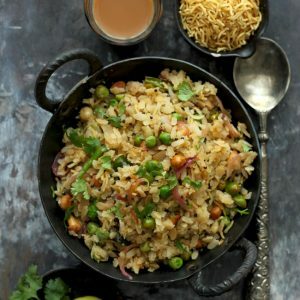 Matar Poha Recipe is one of the most loved Indian breakfast recipes. In different parts of India, this simple breakfast dish has various names – Chura Matar, Banarasi Chura Matar, Vegetable Poha or Kanda Poha. Place the poha in a metal colander and rinse with water. Once the poha is moistened nicely. Set aside. Do not rinse the poha for too long else it will turn mushy. Heat oil in a heavy bottom kadai. Add the mustard seeds and fry till the mustard splutters. Add curry leaves and green chillies to the oil, fry for one minute. Now add the onions peanut and fry for 1 - 2 minute. Next, add the sliced onion and fry till they are lightly golden. Add the green peas and fry nicely for next 5 minutes. Season with salt, sugar and spices. Stir to combine. Once the green peas are nicely cooked add the softened poha. Add fresh coriander, lemon juice and green chutney. Mix nicely and cover the pan with a lid. Allow the poha to cook for 2 - 3 minutes covered for the flavours to combine well. Turn off the heat. 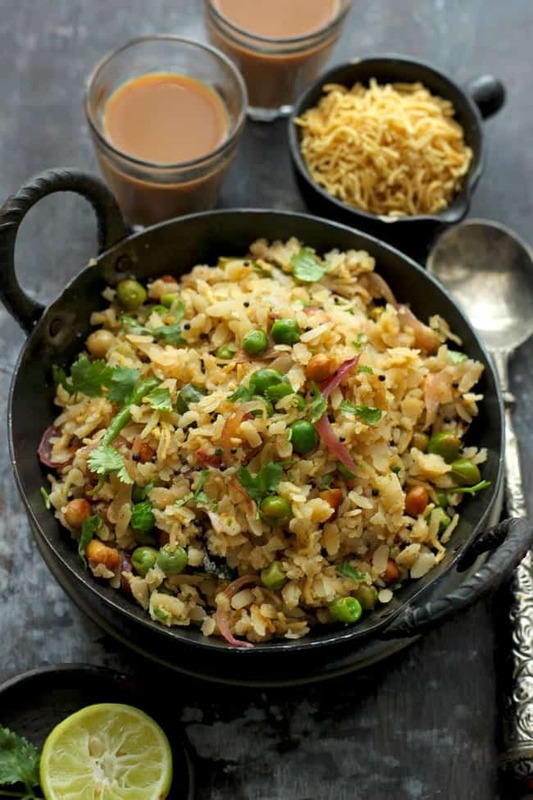 Serve Matar Poha for breakfast or as a tea time snack topped with aloo bhujia. Try to use thick flattened rice (poha) for this recipe. The thin flakes of rice get mushy and do not tend to yield a fluffy matar poha. At times, I add an equal amount of poha and peas in the chura matar. You can keep the proportion either 2:1 or 1:1. Adding sugar is totally optional. But a hint of sweetness gives the flavours of the poha a perfect balance.The sweet tamarind chutney also gives a delicious taste to the matar poha. I just love this recipe and happy to find your blog through Instagram . Thank you so much Priya. I am so glad you liking it! This is “THE RECIPE” i have been looking for…perfect and oh so easy breakfast and anytime snacks solution ???? thanks Hina for making cooking easy for naive cooks like me. looks delicious .. I am in love with your recipes.